What??? 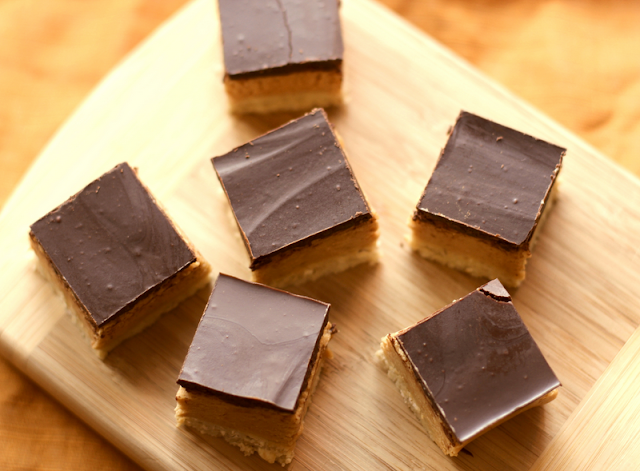 Peanut Butter and Chocolate Shortbread Bars can be healthy?!? Yes! 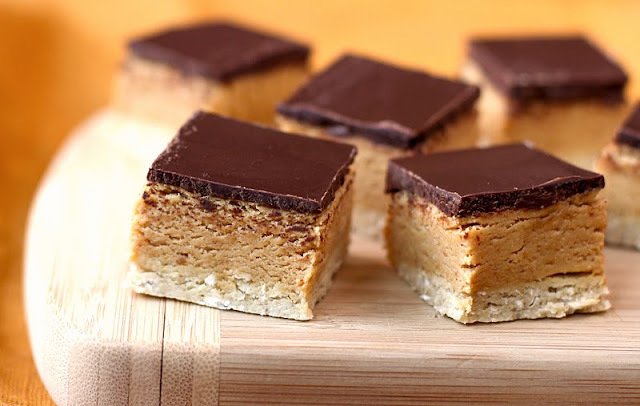 A butter-free "shortbread" crust comprised of whole grain oats, honey and natural protein powder ... a soft PB filling that is to die for, using natural peanut butter ... a delicious, thick dark chocolate peanutty layer to top it all off. 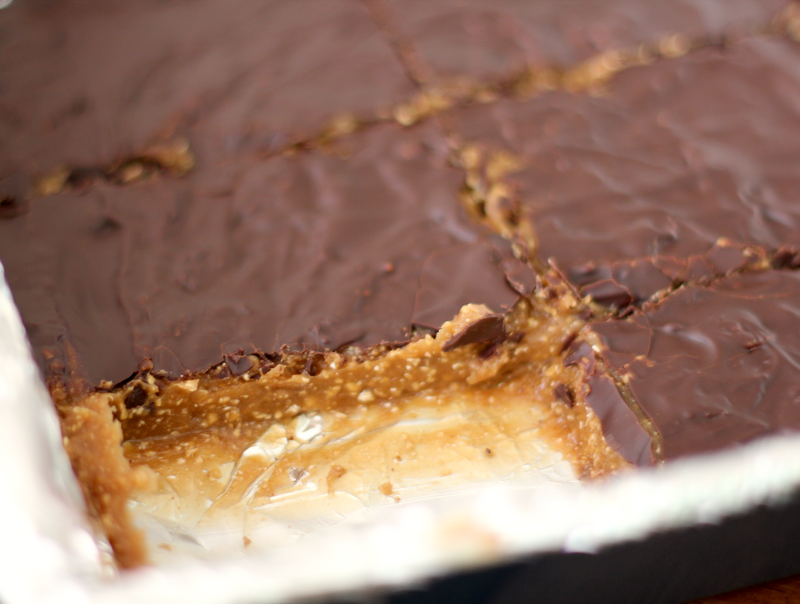 When we're talkin peanut butter and chocolate, I don't think anyone could go wrong there :) Just because these bars were sticky and gooey, they were still mighty delicious! 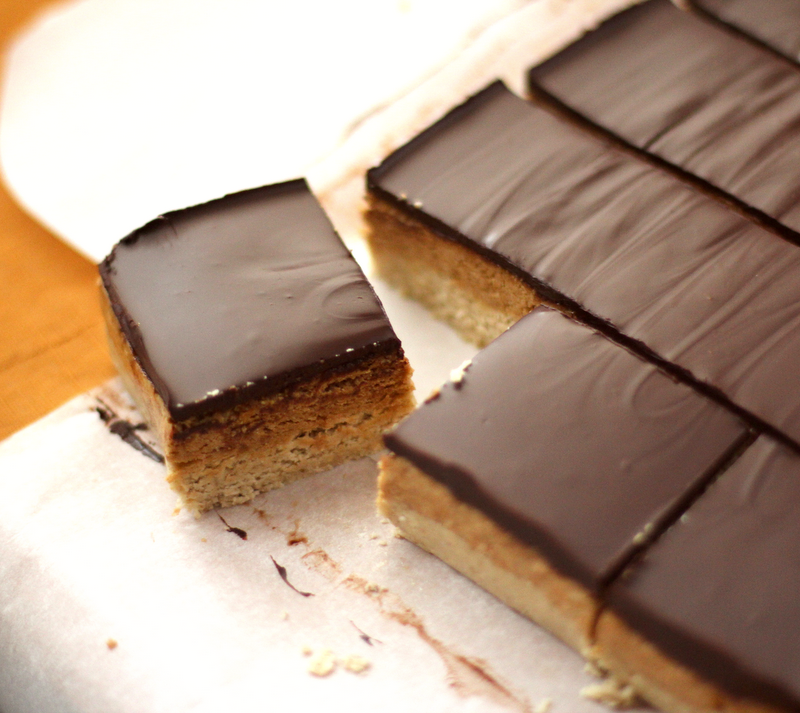 These bars did not have a shortbread crust because I thought of adding it the second time around. Oh, and clearly. . . there was not. enough. chocolate! I was really surprised that the shortbread actually turned out like shortbread! It was crumbly, just like real shortbread cookies are. But, the crust came out thicker than I expected, almost as thick as the peanut butter filling! In the next trial the shortbread crust recipe will be cut in half. As for the peanut butter filling, I was imagining a soft texture. Unfortunately, it was hard, dry and crumbly. I think the dryness factor was because of the brown rice syrup, which is a lot thicker than honey, so in the next trial honey will be used instead. And finally, the chocolate topping. It looked good, the texture was great, but the taste was awful--I used 100% cacao unsweetened chocolate mixed with 2 tbs of peanut butter and and 20 drops of stevia extract, and not even that could rid the bitterness from the chocolate! Plus, right after making the bars, I remembered that I was using whey protein concentrate (a milk product) in the peanut butter filling, rendering the 100% cacao chocolate useless antioxidant-wise (read this post for more info on chocolate-antioxidant absorption). So in the next trial, 60% cacao chocolate will be used for a much more pleasant taste. YUMMM! I don't think the word "delicious" can even begin to describe these cute little baby bites! 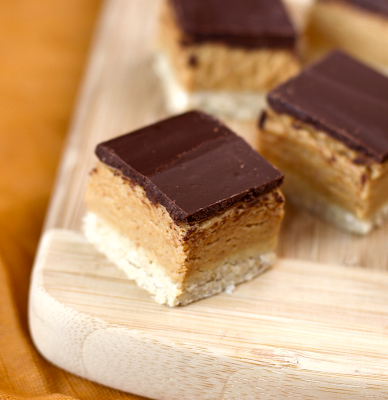 The "buttery" vanilla shortbread, the soft peanutty filling, the smooth chocolatey topping, mmmm. . . much better than the previous trials--no dryness, no bitterness, no sticky peanut butter layer! Although (for some reason) while I halved the shortbread crust recipe, I didn't half the salt. So, apart from the salty crust I made, I have no complaints! Well, I might have one. Dare I say, I think these bars had too much chocolate? I heard you gasp! But don't cover your ears screen, please! Let me explain! Even though the chocolate added a good bite to the bars, I felt it was too strong and detracted from the peanut butter flavor. I think that the 4oz of chocolate I used should be reduced to 3oz, or maybe even 2oz? Oh no, should I retract that statement? Should I expect some hate mail from the chocolate-lovers out there? No, I don't think I'll get hate mail. These bars are just. too. good. They have the perfect balance of flavors with optimum nutrition! 1. Line a square brownie pan with parchment paper both ways for easy removal later. 3. Press the mixture down into the brownie pan until every corner is even in height. This batter makes just enough to fit the bottom of the pan. Refrigerate for 20-30 minutes, or until firm and dry. 1. In a large bowl, add the peanut butter, honey/agave and stevia extract and stir. Add in the protein powder and pinch of salt and stir until combined (you can use a hand mixer for this too). It should look like a big, soft blob of peanut butter play-doh. 2. 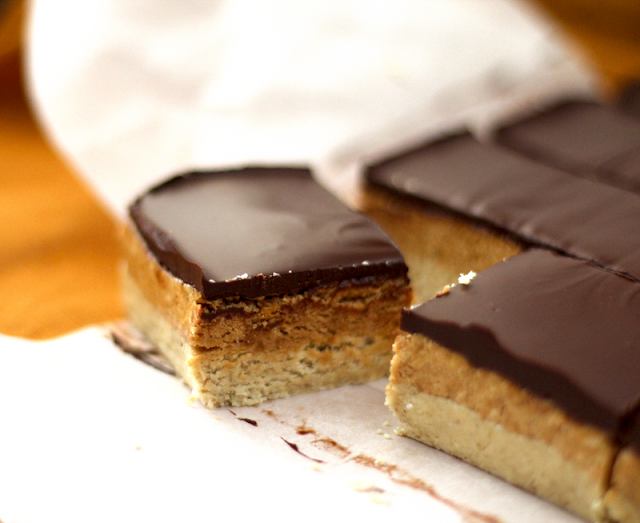 Press this onto the shortbread crust until even in height. I would suggest using a pastry roller if you have one, but I used a rubber spatula. Refrigerate for 20-30 minutes, or until firm. 1. Break up the chocolate into pieces, and microwave at thirty second intervals until melted. 2. Add the peanut butter and stir in until melted and incorporated. 3. Add the stevia extract five drops at a time, stirring after every 5 drops. 4. Pour the mixture over the peanut butter layer (if the chocolate is too hot, let it cool a little bit) and spread until even. Refrigerate until the chocolate has just barely hardened, then take it out and slice (this allows the chocolate so slice in nice lines rather than break, which happened to me because I refrigerated it overnight and then sliced them). Store in the refrigerator covered with plastic wrap. 5. To serve, take out of the refrigerator to soften for 10 minutes, EAT! These are best eaten close to room temp. The fork slides easily into the bar and you get all three flavors in one scrumptious bite! When they are eaten right out of the fridge, the layers will separate on you . . . it's not like I know that from copious experience or anything, because I'm super patient ... that was sarcasm. Mmmm . . . deliciousness! "I'll just have one more" you say. Oh, those famous last words . . .
Ok yes very helpful! So you use regular chocolate that you melt, i.e Ghirardelli. I usually melt choc chips and I think the stabilizers in the choc chips render an un-smooth application. That or all the powdered sugar I add to the frosting/chocolate layer of most of my bars...haha! I didn't measure the oat flour, but I think it would amount to about 1/2 cup to a 3/4 cup. Try adding 1/2 cup of oat flour first, and if the dough is too sticky, add one more tablespoon at a time. Do you know what happens to whey protein when it is baked? Or exposed to heat for that matter? 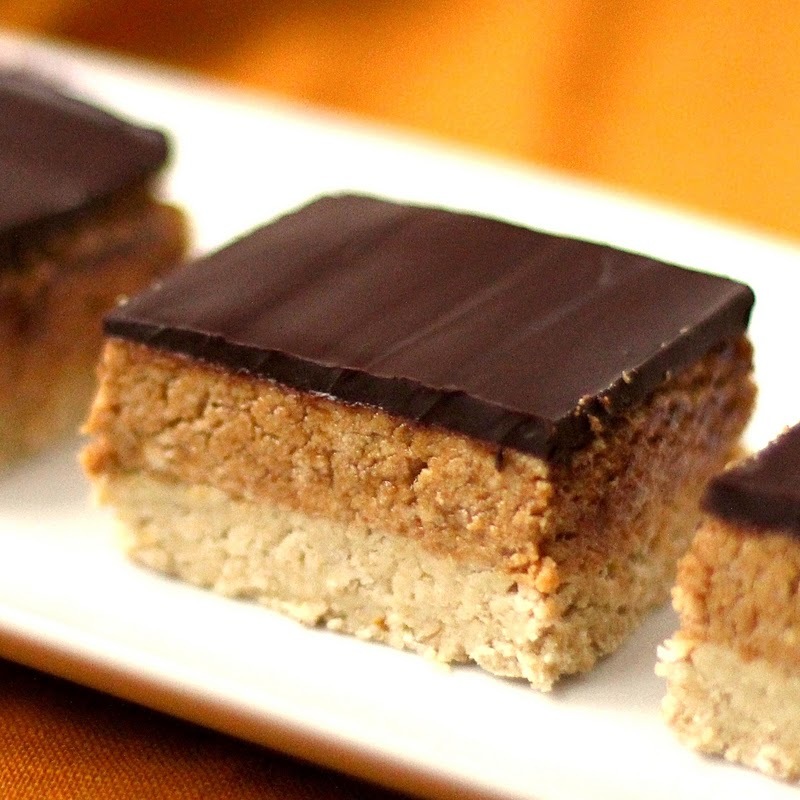 I'm experimenting with some existing dessert recipes and I know this one is no-bake, but I thought you might be the person to know. Protein powders can be baked into bread-like things. I guess you can say they act like a flour? It depends on what brand you use, but in my experience, the texture of an all-protein-powder baked good has never been great and the taste was always plain. That's why I only use it as an additive to my baked goods rather than it being the sole source of "flour." To see what I'm talking about, microwave one scoop of protein powder with 1/2-3/4 cup of milk (or nondairy milk) for about a minute, or just until it's cooked all the way through. I did this in a mug, and I did not get a pleasant result. I hope you do, though! Keep in mind that we may have different oats, or peanut butter and protein powder, so give or take on the cals and protein levels. Just to note, don't be afraid of the calorie amount--although these bars are delicious, they are very rich and one bar is plenty (and not to mention filling from the healthy fats, fiber and protein!). Great, thanks for the info I can't wait to try them! I really hit the jackpot finding this recipe! First of all - your photos made me want to make them right away! Great job on the photos! Your directions are superb and made my batch I made last week come out perfect! They are SO addicting, that's the only down side! These look so wonderful. Who doesn't like chocolate and peanut butter?? I can't wait to try this recipe, but I do fear I will not stop eating them with just one...however - the protein level is good, so that makes me feel good about it. Hi Andrea, I use protein powder in my dessert recipes because I try to make my desserts "nutritionally balanced" (with healthy fats, slow digesting carbs, fiber and protein) so they can be enjoyed as an everyday snack or meal, rather than a once in a while treat. I've used dried milk powder in a few recipes of mine, but not as much as protein powder. 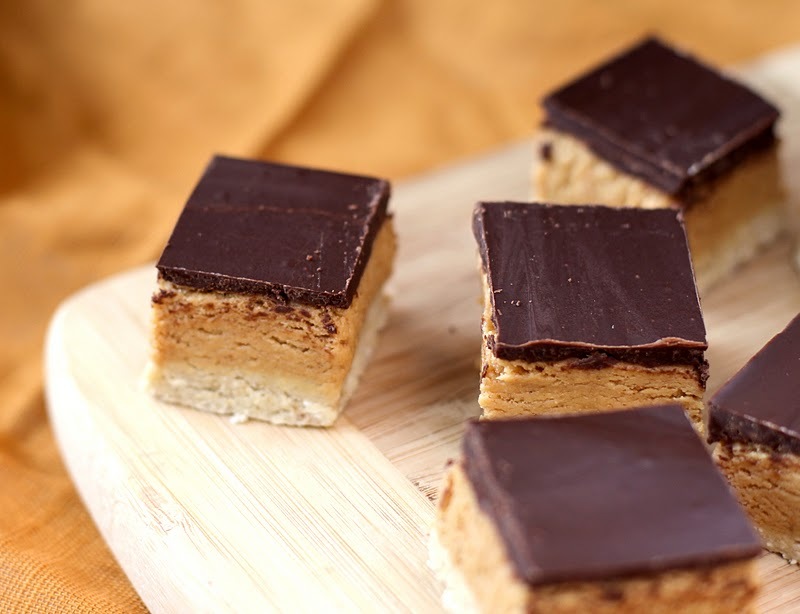 I find that it has many of the same qualities when it comes to no-bake treats, such as these bars, but I haven't had much luck using it in baked goods (it dissolves very fast and doesn't provide structure like protein powder). I'm sp glad I found you! You must have posted this to Tropical Tradition's recipe site because I first saw it there and LOVE it! I also make it using 1/2 almond butter and 1/2 coconut butter instead of PB. Yeah, I did post to TT's site! And using almond butter and coconut butter sounds so good, I definitely need to try that :) I'm glad you like the bars!